A ground loop in your AV system caused by antenna connection or TV cable is very common if you have your computer connected to the same system. This type of ground loop problem can be solved by using suitable isolation between your AV system and the antenna cable. The simplest way to get rid of the hum is to disconnect the antenna cable from the AV system. If you still want to watch cabe TV or listen to your radio an keep the system hum free then you have to install isolators to all those antenna cable connections your system has. For TV transmission high frequency signals such a simple transformer (using a suitable core) is almost perfect. Do not try to use other types of transformers because your circuit would not work then and they would cause annoying interference to other TVs connected to same antenna network (and in worst case you get cable TV people hunting for you because you messed with their cable network). On the picture above you see the whole adapter and the picture below is close picture of the details inside the antenna isolator adapter. 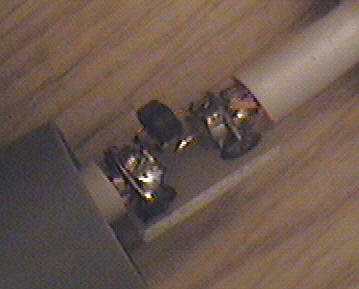 It had three turns of thin wire in primary and secondary wrapped around small ferrite core. The wiring inside the isolator is very similar to the audio isolator circuit, the only difference is that now connectors are antenna connectors and the transformer is the one designed for antenna signals (described above). The thin wires between the transformer and the coaxial cable are kept minimum to avoid the adapter to pick up interference. If you live in Finland, you can buy this type of isolation adapter from SUOMEN RADIOAMATЦЦRITARVIKE OY under name J A-A Junction hдiriцadapteri televisioon. It costs 43 mk (about 10 US dollars). This circuit is a simple isolator for TV and Radio antenna connection. This circuit passes radio frequency signals nicely, but does not pass significantly 50 Hz signals, so the ground loop is eliminated. The circuit can be easily built into antenna connector or to a small box. I would recommend to use small metal box, where you connect one of the antenna connectors to the metal box and isolate other connector from box. Metal box allows mechanically strong construction and provides good shielding against radio interference. The capacitors in the circuit should be rated at least 250VAC (400V DC) to make sure that the adapter with stands situation when antenna network ot television/radio is floating at mains live potential. There is one disadvantage of this the circuit breaks the continuous shielding of the antenna cable which makes you antenna cable pick up radio interference more easily (for example radio interference picked by ground loop itself). Usually this is no big problem, but if you notice severe interference then you might have to stop using this isolator. The beast place to put this isolator (to keep possibility of interference minimum) is just between TV receiver and antenna cable going to wall. This capacitor isolator scheme might feel quite strange at the first sight, but it actually works and cuts the ground loop because it provides high impedance to low frequencies (50 or 60 Hz mains frequency) but has low impedance at the RF frequencies that are used at cable for TV channels. Capacitor isolator approach is an old trick used in TV industry. When the old TVs had their chassis at mains potential, they used this kind of approach to make sure that the dangerous voltage can get to the cable from the TV but the RF signal goes nicely to TV. Isolator used in one old TV had 330 pF 500 VAC capacitor which connects the center of the coaxial cable to tuner and the shield of the coaxial cable was connected to TV chassis through high voltage feedthrough capacitor (value unknown). There is an alternative approach to antenna isolation problem: use transformer as in audio lines. The problem is to how to make a good transformer for antenna signals. If the transformer causes impedance mismatches, this can cause signal reflections which disturb you and maybe your neighbors also. One way to do it is to use readily available 75 ohm to 300 ohm transformers (called "baluns" or "matching transformers") used when connecting old televisions with 300 ohm antenna input to modern antenna network with 75 ohm connectors. Those units are readily available from TV shops. Be sure to buy models which have no galvanic connection between 75 ohm input and 300 ohm output (so there is isolation between input and output), because some models only do impedance matching but galvanic no isolation (they are useless in this project). The circuit is easy to build. Just take two of those 75 to 300 ohm antenna transformers and connect their 300 ohm sides together. Now you have antenna isolator you need. This circuit has been suggested by Paul Grohe (grohe@galaxy.nsc.com), who suggested that suitable transformers are available from Radio Shack (Radio Shack cat. #'s 15-1140 and 15-1253 or MCM #33-050 and #33-010). LiveDV magazine suggests using Radio Shack #15-1140 and #15-1523 antenna transformers wired together in their "Soundings: Getting Wired" tutorial at 1996. If you experience radio interference picked by this circuit, you can try the following method to make shilding ogh the circuit better: You can wrap the whole little assembly in aluminum foil and ground the foil to the "cable" cable shield. But don't let it touch the other ground. Isolation between antenna network and TV/radio equipment electronic circuit. Video and TV electronic circuits and schematics.